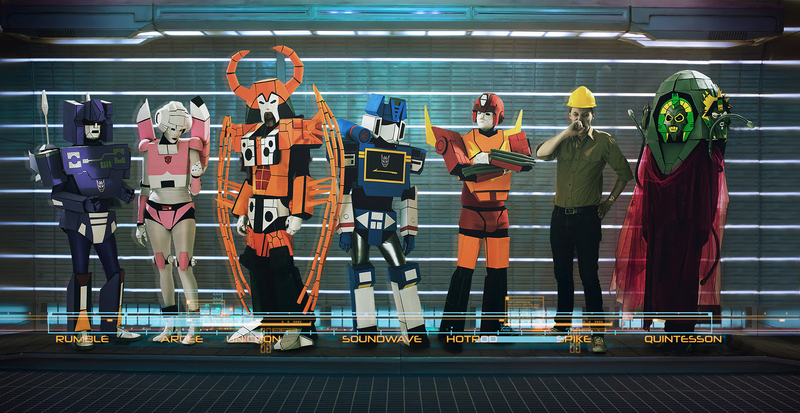 From left to right: Rumble, Arcee, Unicron, Soundwave, Hot Rod, Spike, abd a Quintesson. HOTROD, ARCEE, RUMBLE, UNICRON, SPIKE, SOUNDWAVE, BUMBLEBEE, AND A QUINTESSON HAVE BEEN BROUGHT TOGETHER BY THE POWER OF ROCK. TOGETHER, THEY ARE THE CYBERTRONIC SPREE. Not only are the costumes astonishingly accurate, but they’re built in such a way that the band members are still able to effectively play all their instruments! It’s a pretty remarkable achievement. Except for the guy dressed up as Spike, that’s an easy costume. They also pepper their act with non-Transformers songs, and they have a couple of excellent choices, like this super-obscure theme song to the 80s Droids cartoon, which was about the adventures of C-3PO and R2-D2 before Episode IV. Oddly enough, I can’t find any record of them playing Weird Al’s “Dare to be Stupid” song, which was on the Trasnformers: The Movie Soundtrack. I’m not sure why, maybe there’s a different rights issue involved? Anyway. So there you have it. That exists.